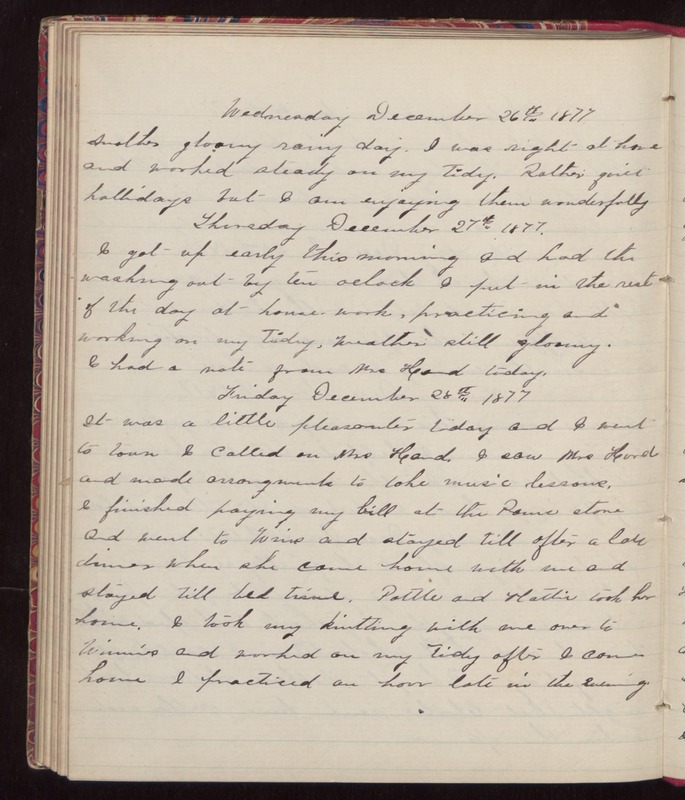 Wednesday December 26th 1877 Another gloomy rainy day. I was right at home and worked steady on my tidy. Rather quiet hollidays but I am enjoying them wonderfully Thursday December 27th 1877. I got up early this morning and had the washing out by ten oclock I put in the rest of the day at house-work, practicing and working on my tidy. Weather still gloomy. I had a note from Mrs Hand today. Friday December 28th 1877 It was a little pleasanter today and I went to town I called on Mrs Hand. I saw Mrs Hurd and made arrangements to take music lessons. I finished paying my bill at the Panic store and went to Wins and stayed till after a late dinner when she came home with me and stayed till bed time. Pottle and Mattie took her home. I took my knitting with me over to Winnies and worked on my tidy after I came home I practiced an hour late in the evening.